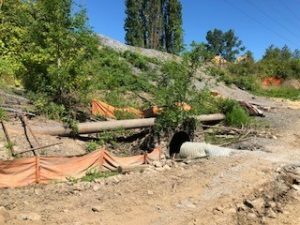 Recently a large northwest utility had a potential environmental issue with an abandoned pipeline that traversed a protected area in Oregon. 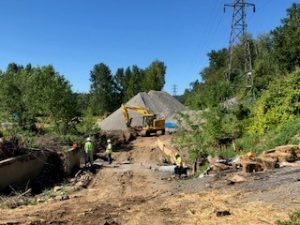 The US Army Corps of Engineers had chosen the area to replenish a natural salmon hatchery that had been cut off from the Willamette River many years ago when a train crossing was built. It was determined that the line would have to be removed in order to allow for the construction of the new river access. The line had been filled with water when it was abandoned and the highly contaminated water now posed a considerable problem. Removing and disposing of the water would be a logistical nightmare as the line was miles long and the site was a mile from the nearest accessible road. It was determined that creating 2 ice plugs on either side of the access stream and removing only the water between the ice plugs so the lines could be capped and the cut off pipe removed would be the best option. COB Industries was contacted about the feasibility of the idea and availability of the equipment required to conduct the project in an urgent fashion as the project was on going and time was imperative. 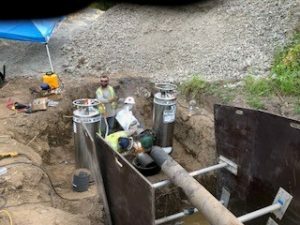 Within a week the equipment was available (including borrowing a 10” freeze jacket from another customer) and a COB representative was dispatched to the site to provide training and consulting while the project progressed. Logistics at the site were quite formidable as no vehicles other than UTV’s were allowed to access the site via a pedestrian foot path(heavy equipment was bought in via rail). This meant bringing the liquid nitrogen supply in 1 tank at a time from over a mile away. (It was determined that over 16 liquid nitrogen dewars would be required to perform this double 10” freeze.) Adding to the problems the area was experiencing record heat which would make any freeze even harder. 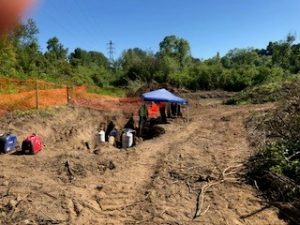 Two pits were excavated on either side of the creek access exposing the pipe and the anti corrosion coating was removed. Once the pits were open and secured the freeze equipment was installed. Freezing commenced early the following morning. Due to the record high temperatures combined with little to no shade on the pipe (or freeze equipment) higher pressure nitrogen supply was required. 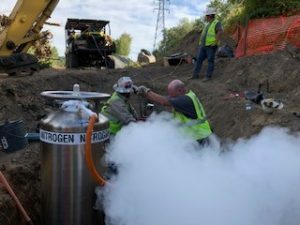 The freeze was begun and the added flow rate of nitrogen was able to overcome the heat load in the environment and the ice plugs were successfully completed. The pipe was cut on both sides and the remaining contaminated water drained to disposal containers that would have to be taken away. Waiting welders quickly capped the open ends. The freeze equipment was shut down and the ice plugs allowed to thaw naturally. The proposed river access refurbishment was allowed to continue the following week bringing life back to a vital natural habitat.